We’ve come a long way haven’t we? I remember when you were all trussed up in wrapping paper beneath our tree. You were a Christmas gift from my big brother, and you were from a thrift store and a handful of sizes too big. When I ripped the paper off of you that sunny morning in December and saw those three pairs of eyes twinkling from the breast of the shirt, I knew I’d found a couple of buddies that would stick with me for a long while. 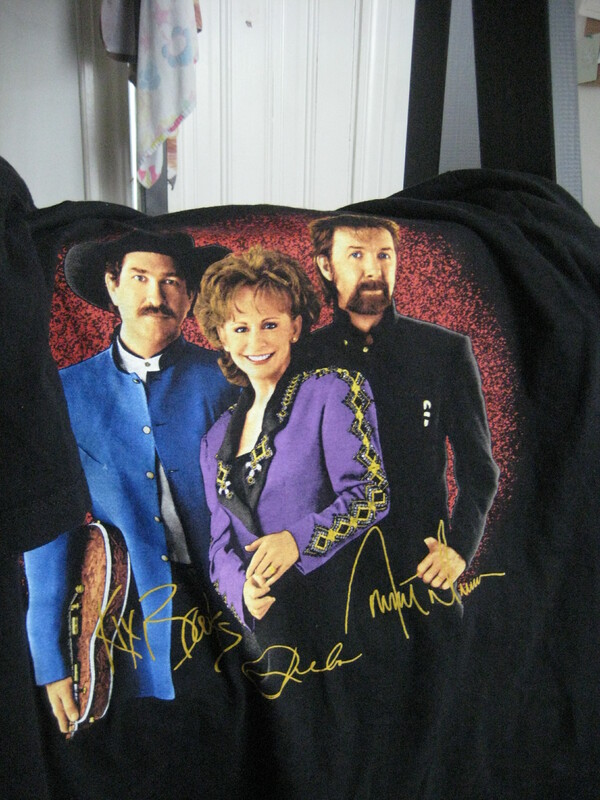 Oh Reba, oh Brooks and Dunn, we’ve had a lot of good times. You came with me up to Boston and we showed those people what real Americans are like. I wore you underneath a duck-patterned prairie dress to a formal party and we danced the night away, worrying only about when the music would stop, and not caring about pit stains. Life’s too short to worry about pit stains. Now we’re here in San Francisco, another city on the bay. And I’ll be honest with you Reba, Brooks, and Dunn: I’m tired. My computer woke me up this morning at 6:30 because it was whirring so loudly, panting like a butcher on the 4th of July. A couple of hours later I went into “the city,” which is what the folks up here call “San Francisco,” and had an interview at 10 o’clock for a job that I’m not sure I even want. While on the way to the train station a young British hippy asked me if I wanted to buy an apple. He had two tiny apples in his hand and I said no and he said thanks for smiling and nice hoodie. I wish you could have seen him. More strangers talk to me up here than most anywhere else I’ve been, but it’s not too bad. What would you do, Reba? Would you sing them a song and lift their spirits? How did you know what you wanted to do, and when you figured it out, how did you get it? Can you really have it all? One day I’m going to have it all too, but right now I’m tired. I’m going to finish my coffee while staring at you three, your eyes sparkling back at me and then maybe I’ll get the big idea and we’ll all have to admit my brother is the genius we always knew he was. You’re the real heroes, you the t-shirt dwellers, the silent inspirers. How many have you cheered on to victory with your never-ending mirth? No matter what the Californians say to you up here, no matter what they think of you or what kind of names they call you because you’re not from somewhere that has a San in front of it or some other liberal name, just remember that to me you are special. I love this t-shirt and am going to wear it more often so people around here can get some freaking cultural education. I came not a moment too soon. This is an amazing t-shirt. And I have my brother to thank for it all. Thanks, brother. What happened to them, for some reason, they sound familiar to me. I think they’re around still. But mostly they’re hanging out with me. Thought provoking on a day that flowed by all too smoothly. Smooth like peanut butter? Gotta have some crunch. Your similes are amazing, Emily! I’m glad you think so–I enjoy coming up with them. Maybe I should teach a class on it?